The mobile phone has become an indispensible equipment for Asian youth. PwC’s 2007 survey of nearly 8,000 of their staff from 17 countries around the world (78% aged between 16-34 yrs) revealed a whopping 98% mobile penetration rate in Asia-Pacific countries, with a significantly lower 62% fixed-line penetration rate. 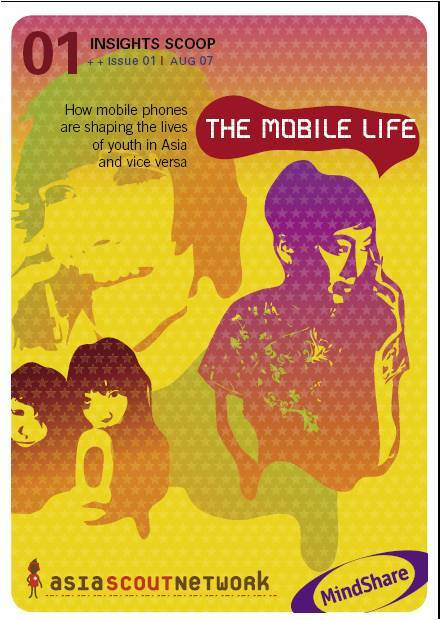 The first Asia Scout Network pan-regional summary report by MindShare is therefore dedicated to the mobile phone – how mobiles mold the lifestyles of Asian youth and vice versa. Findings are based on updates on the Asia Scout Network blog from our city scouts in Tokyo, Singapore, Jakarta, Bangkok, Sydney, Shanghai, and Kuala Lumpur. Entry filed under: all asia, australia, china, indonesia, japan, malaysia, media general, mobile, singapore, thailand. Do media agencies need to hire creative people? Facebook or MySpace or should you even care?